We woke bright and early and got ready for the trip out to Kokerboomkloof. We needed to be self sufficient for at least 3 days. We had at least 50 liters of drinkable water on board, but we needed some wash water. In addition to that, I got hold of a whole lot of 20 liter "papsakke". They are used in the wine industry and are pretty strong. So we filled 3 of them and stashed them in the back of the Hilux so that we could use them for showers and washing dishes. We hit the trail and stopped at the Hand of God. Just a pity a lot of people decided that the back of the rock is the perfect place to use as a toilet. 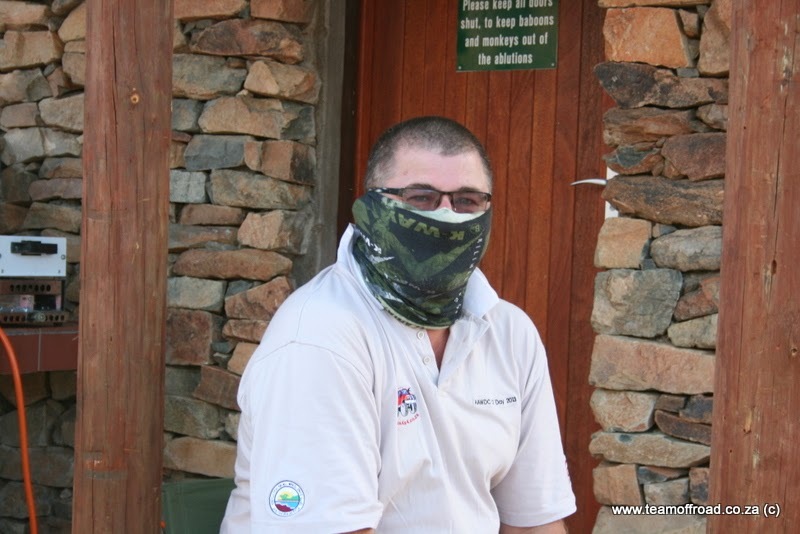 The flies and smell was quite unbearable..
Halfmens in the Richtersveld. Very few of them around nowadays. Then it was Akkedis Pass. It is tight with the big Hilux, but we got through without too much damage. At this stage I am very nervous about tyres, and over compensated a little, neglecting the right hand side of the vehicle somewhat. Around a tight bend the right hand side Excalibur got a bit of a knock that will remind us of crossing the pass. Gysie will have to make some sturdy rock sliders me thinks..
We pulled in at De Hoop, which was pretty much deserted. We spent a night here on a previous occasion and it was pretty full then. The river is also much lower than we expected. Then we had an encounter with a crazy engelsman in a Fortuner who was buzzing around us like a fly. Turning around and driving all over the place. We took a short cut to get away from his dust, but somehow he ended up in front of us again about 6 km further. Luckily he took the turn off to Richtersberg and disappeared over a hill in a cloud of dust. 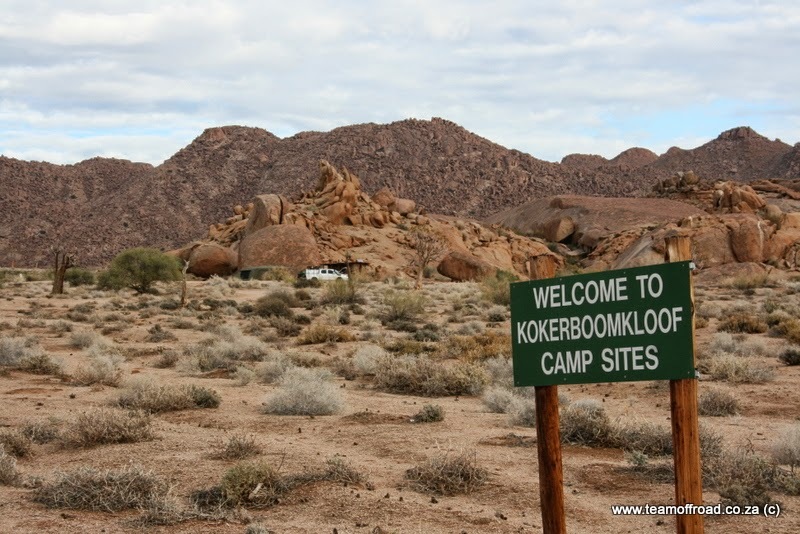 Once we arrived at Kokerboomkloof it was about 14h00, it was hot and stuffy and the camp site was empty. We were going to be alone in this little corner of the "wilderness"!! The silence was deafening. The weather also showed signs of possible thunder and rain activity and the humidity was quite high. 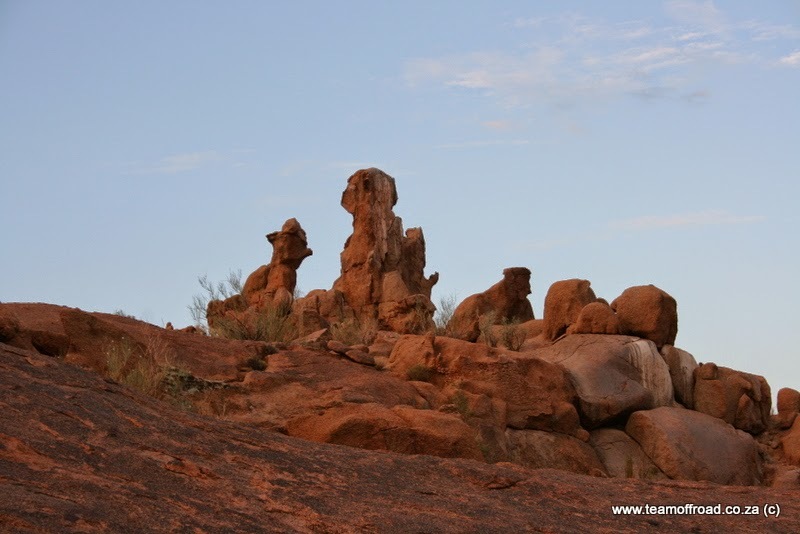 The rock formations in the Kloof is something else! 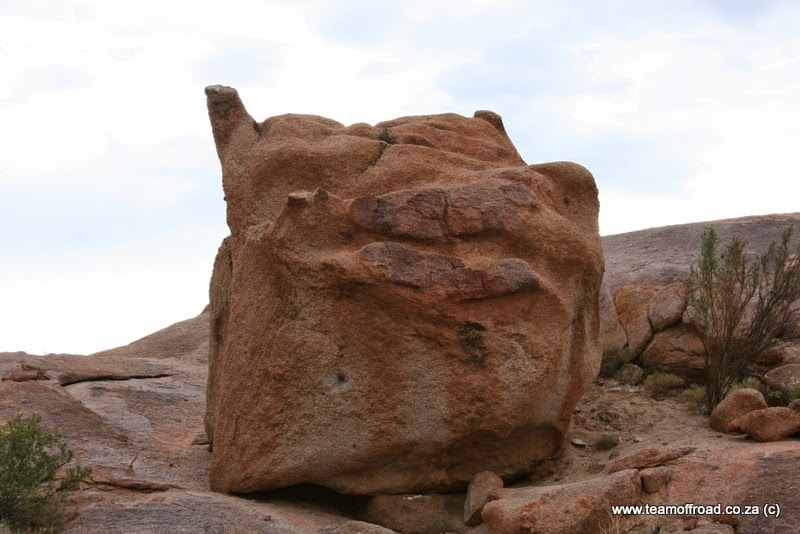 As you look around you see all sorts of shapes and symbolism in the rocks. We were fascinated..
We pitched camp in the shade of a large granite boulder which would provide shade for the tent and protection from any NW winds that might come up. And then we hit the jackpot...... Sometime between 2011 and now, SANParks thought it apporpriate to get a permanent water supply to Kokerboomkloof. We had running water, and flush toilets. Sort of a let down, but also a huge bonus. As soon as the sun started setting, the muggies bit the living crap out of us, and not even Peaceful Sleep, Tabard, Bushman's or Khakibos helped to keep them at bay. It was still hot and stuffy, but shortly after sunset they disappeared and we could have a braai in peace. It was amazing having the whole place to ourselves with lightning flashes dancing on the horizon. That night at about midnight there was a lightning flash followed by an almighty thunderclap and the heavens opened. For about 45 minutes it rained heavily and everything cooled down.... Our new tent and extension is water proof, test 1 done and dusted..
A lazy day spent in the campsite mostly. 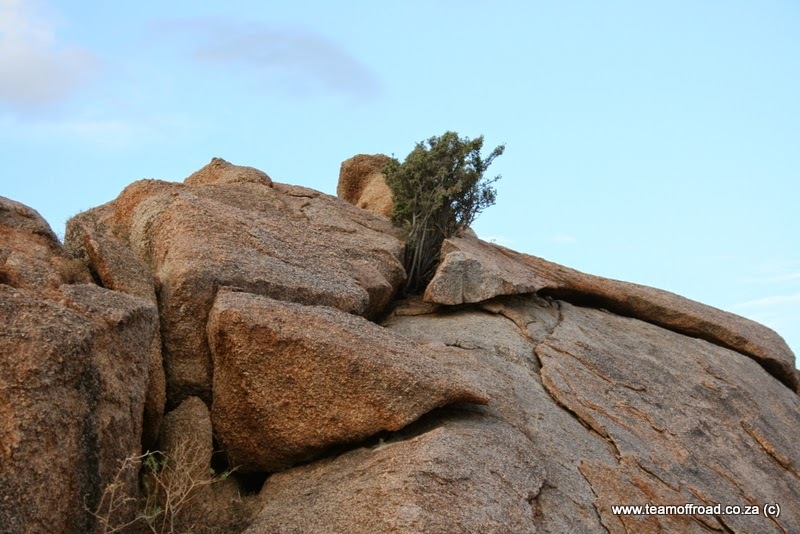 We climbed a few of the rocks and took some pictures but we didnt drive anywhere. The solar panels took care of the fridge and the aux battery. Whenever the muggies got too much we ducked into the tent, switchd on the ceiling fan and read books and magazines. We absorbed all the silence and recharged our own batteries as well. With the Kariba hot water geiser on the stoep we had a shower after dark, and retired to bed. Today we decided to get our lazy asses out of the campsite. So after a quick breakfast we drove down the 'Kloof to the end of the track. The sides of the kloof closes in on you and you get to a point where the trak just ends. Cannot drive any further down because of huge boulders blocking the way. We stopped and took some pics. 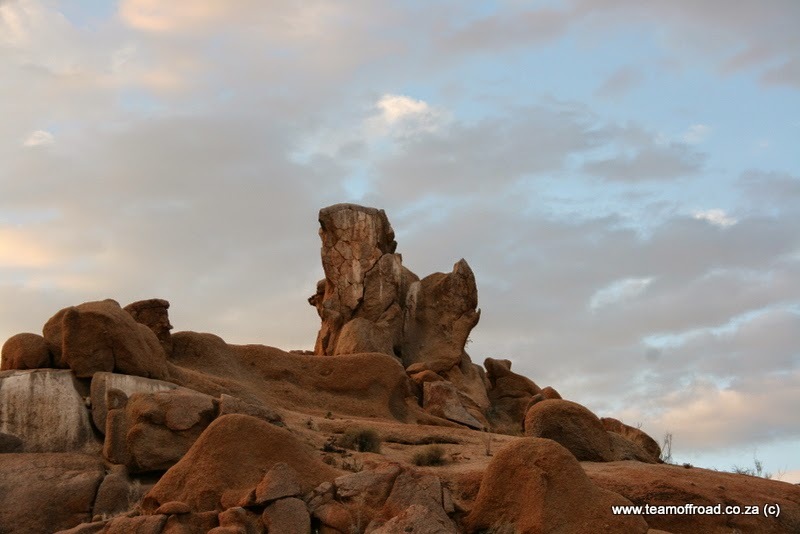 After the drive down the kloof we decided to drive out to Springbokvlakte and see where the road takes us. There's your answer.. What a shame.. This track leads straight down to the river, but we couldnt go there. At least here we could get cellphone reception from the MTC tower at Aussenkehr, and E caught up on news from home. Oh the marvels of modern technology!! We drove to a lookout point between two hills and this is what we saw..
And then we drove to another lookout point and looked out over Springbokvlakte..
That evening we opened a bottle of special wine..
And just before sunset we drove out to take some pictures of the Toe and some other rocks in the last light of the day. 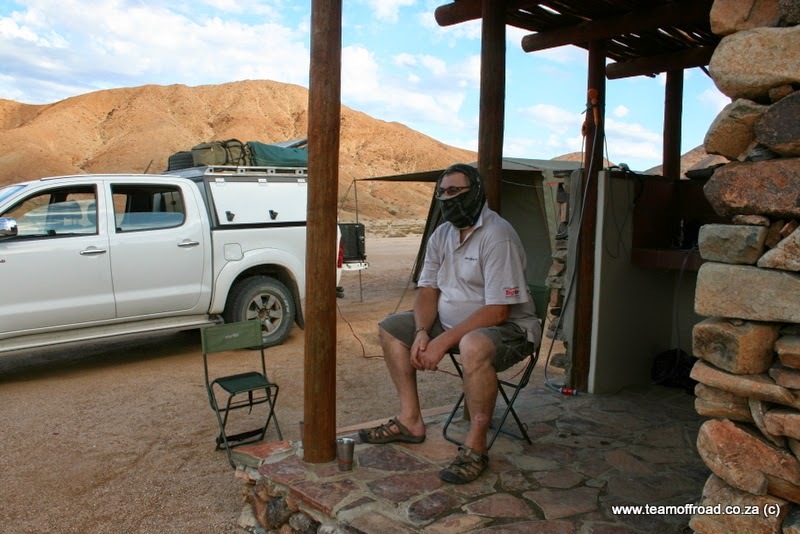 Another exciting day in the Richtersveld came to an end. This place is truely amazing. Today we pack up at Kokerboomkloof. Our stay here was fantastic. Not as rough as we expected due to the availability of running water but nevertheless very enjoyable. We emptied out the "papsakke" as the water they contained was not going to be needed any longer. There was a stiff breeze so muggies and other flying goggas were limited. The wind was welcome although it made packing up the tent and extention a bit of a challenge. But nothing we couldnt manage. Before long the Hilux was packed and we were ready to move on. Our destination was Gannakouriep. This is what SANParks classify as a "wilderness" camp. Why on earth I would not know because it is pure luxury. We always reward ourselves with a couple of nights of nice digs after we spent some time doing it rough, and this was it. As we hit the road near the turn-off to Richtersberg we encountered 2 vehicles in convoy. A Disco 3 and a Terios with (what looked like) an oversized rooftop tent on it. 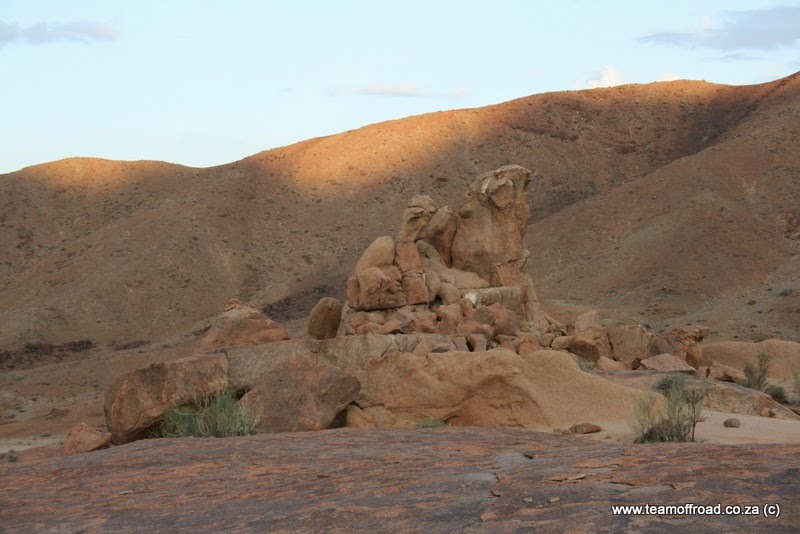 We took it easy taking in the scenery as we drove along dry riverbeds along bumpy tracks. When we arrived at Gannakouriep we were welcomed by the camp-supervisor and showed to our cabin. The wind was quite strong, and there were signs of some weather creeping in from the West. We baked some bread, and had a braai later that evening before turning in.. No muggies around here while the wind blows. Not much happens on this day. After a hearty breakfast we hit the trail and explore the area. We drove out to Hakkiesdoring, which is a hikers overnight spot. The facilities are basic, you get a room with 2 single beds. Nothing else. There are bathrooms, and a communal kitchen. Also a huge bouma for a lekker Richtersveld braai and a lookout tower. Hakkiesdoring is basically a "base camp" for hikers doing the hiking trail that starts about 3km from there and takes you into the mouintain ranges to the west of the park. 40km of hiking in 4 days. We met a couple there who spent the night there and were on their way to do the hike. We wished them good luck. Back at Gannakouriep we spent the last hours of sunlight reading and trying to catch some sunshine as it was getting very cold. 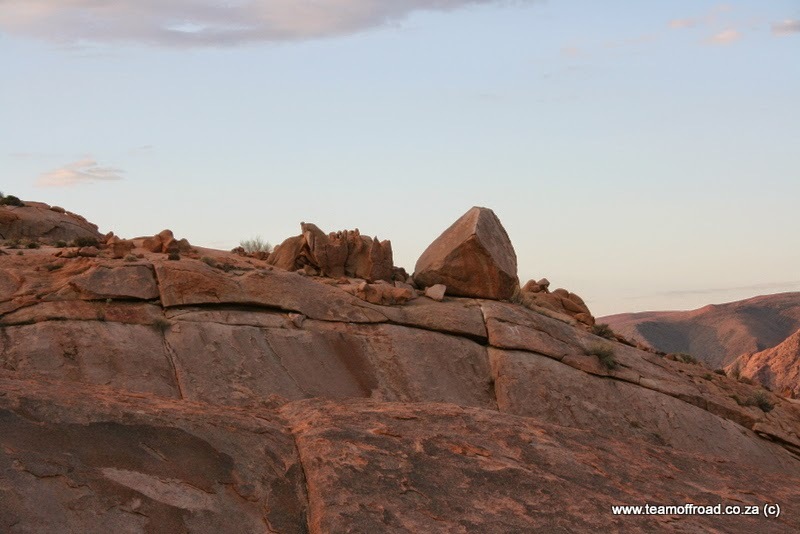 We pack up at Gannakouriep to drive to Sendelingsdrif via the Helskloof pass. 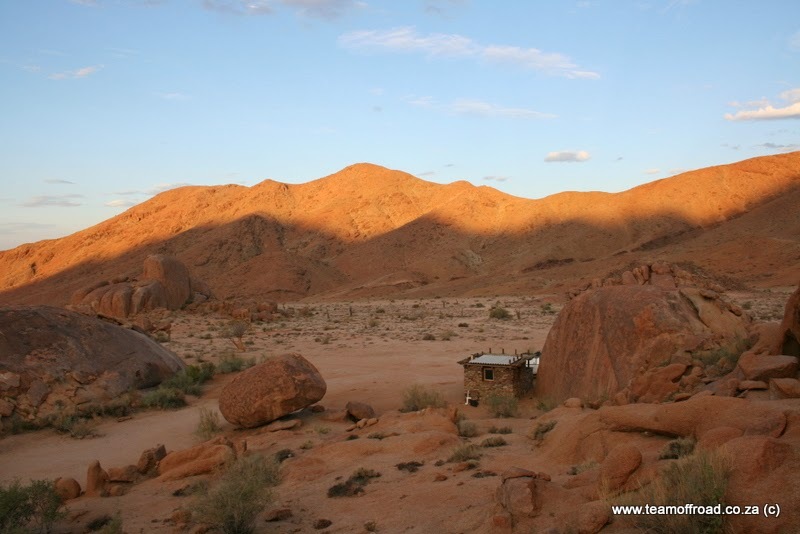 We will be spending the night at Sendelingsdrif in a "chalet" before crossing the river into Namibia the next day. 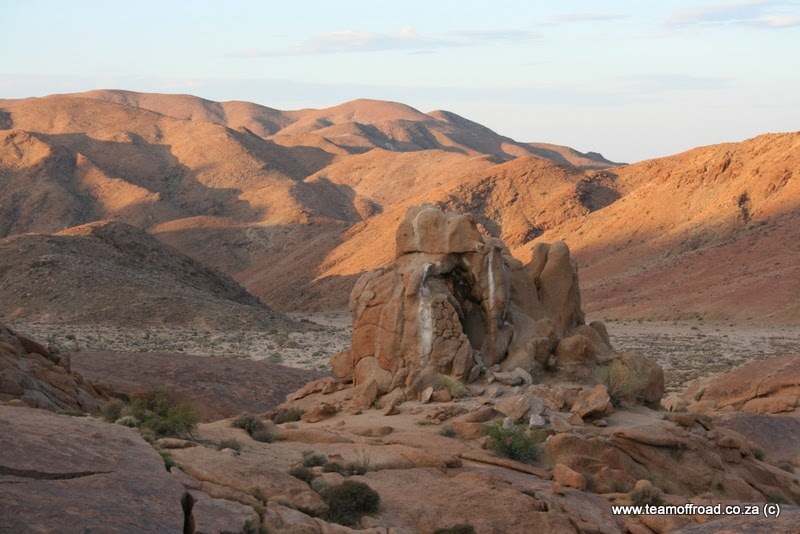 The road is the normal Richtersveld 2-spoor and we take it easy because we have a lot of time on our hands to enjoy the scenery. 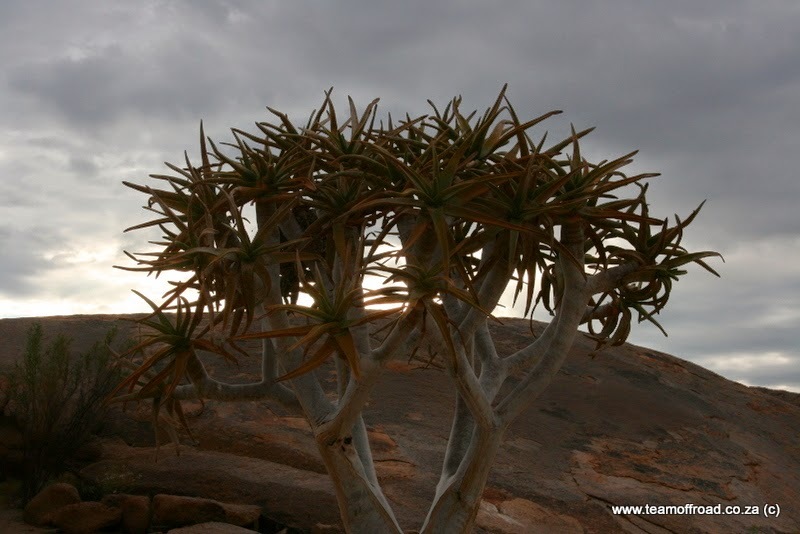 We see this beautiful kokerboom on a hill. And more vegetation that is more prevalent on the western side of the park. We miss the Avenant graves completely. Maybe the sigh was blown away by the strong wind blowing from the north-west. Before we know it we are on the "main road" back towards Sendelingsdrif. For the rest of the day we potter around our "chalet"
We enjoy this tour with short hops and lots of time to just relax and do nothing.. Early morning pack-up and go time. The border crossing is quick and painless on the South African side. From the Immigration office we drive down to the pontoon, and the friendly staff make sure we are safe and sound before they transport us across the river. This includes getting tangled up in a life vest. I have video of this and will post it on Youtube. Once we arrive in Namibia, we do the immigration stuff and then we hit Rosh Pinah. Here we do some grocery shopping, and we meet family for a breakfast at the Wimpy. We also fill up with 50ppm diesel and pay in cash. Even the petrol attendants are not too happy with the whole cash thing, but thats what they have to deal with. It is about 13h00 by the time we leave Rosh Pinah. The road alongside the Orange River is in good condition and we make good time. At the crossing of the Fish River we notice that the Fish River is flowing strong, and that there is a new bridge. The old one got washed away too many times. We turn left into the Gamkap river bed and drive all along it towards Ai-Ais. This is a beatiful drive with high cliffs on the sides. We arrive at the Canon Roadhouse during the late afternoon. We wanted to camp here, but didnt book before hand. They could help us out with 1 nights camping but we had to move on the nest day. No problem, we'll take it and hunt for alternative digs the next day. After consulting T4A I got hold of the telephone number for Hobas, and phoned. They were more than willing to help us out with a campsite for 2 nights. We were sorted. You can even phone home!! We pack up camp and depart to Hobas around 10h00. Only about 14km down the road. We didnt pithc the entire tent with the extension, only the dome with its own flysheet, so packing up was over in a jiffy. 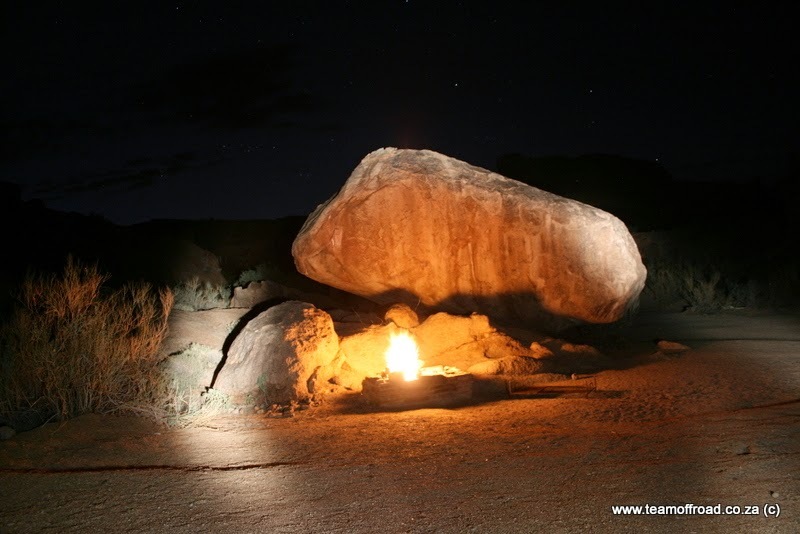 Once we got to Hobas we booked in, and seeing as we were the only people in the camp site we explored a lot and found the best spot. We were going to sleep 2 nights so we wanted something a little "special". There is electricity and running water, so I put the fridge on mains and the aux battery on the Benton. I noticed during the last few days that the aux battery does not "hold its charge" and runs down very quickly. During late afternoon we light a fire. We enjoy relaxing under the trees with a nice breeze keeping the worst of the heat at bay. 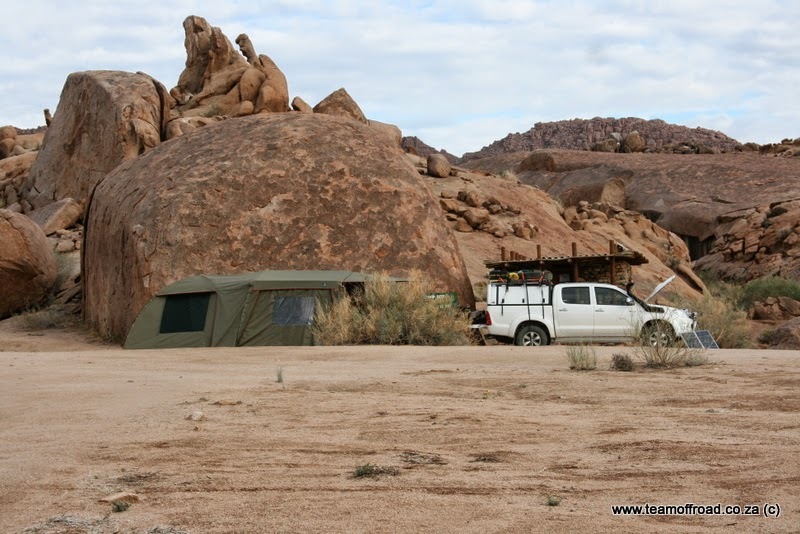 Once again we decided not to pitch the extention for the tent, as the camsite was nice and shady and our kitchen setup works nicely from the back of the Hilux. While the Republic is celebrating Freedom Day we are blissfully unaware of any politickery here at Hobas. We start out just after first light to go visit the Fish River Canyon, to take some nice photographs. The canyon is amazing!! We spend hours at the lookout points and on the tracks around the rim of the canyon. Later that afternoon we decide to go for a drive towards Ai-Ais. On our way up we gave it a miss, as we spend too much time in Rosh Pinah and didnt want to pitch camp after dark. Approx 20km from Ai-Ais I feel the back end of the vehicle getting "loose" around a bend, and when E looks in her mirror she announces another flat rear tyre. We stop.... Brand new Hankook Dynapro AT/M with less than 1000km on it, deflating fast. Luckily the puncture is on the tread. I suspect that it picked up a stone that was kicked up by the front wheel. Out comes the snot-plugs. It takes a double. We inflate the tyre, and see that it is still leaking. In desperation I rummage around in the toolbox and find a long forgotten can of TyreWeld. With the TyreWeld in the tyre we inflated it to 2.3 bar and drove slowly for about 10km before we stop again to check the tyre. It's not leaking any more. The TyreWeld worked!! It is our last night at Hobas before we take the road back home, and with our latest tyre-episode we decide on a plan of action, as we need to get to a place where we can have the tyre fixed by a professional. We have 1 more spare, but it is a General Grabber AW with limited tread, and I dont feel comfortable using that on any kind of rough dirt road. Just before we retire for the night I check the Hankook again and the pressure is still 100%. Thanks TyreWeld!!. We wake up at 06h00. But in Namibia it is only 05h00!! As the sun comes up we start packing up our camp to take the long road home. It goes quickly and before we knew it we are ready to go. We have another quick cup of coffee, check the Hankook, wash hands at the bathrooms and then we hit the road..
Our first destination is Grunau, to see if they can help us out with the Hankook. If there is nobody there who can help it is 50km tar road to Karasburg, where we knew we would find help. On the road to Grunau the scenery is really really nice. No luck in Grunau. You can get a garage pie and heartburn there but that's about it... We proceed to Karasburg where we pull in at Carleys Motors. A couple of young fellas work on the stricken tyre and before long the wheel is plugged with a proper mushroom plug. It was a lot of fun "working" woth these guys on the tyre. R45 later we hit the road again confident that the Hankook will make it to Cape Town. Outside Karasburg we take the road to Warmbad, because we can. Our destination for the day was either Pofadder, of if we had enough daylight left, Loeriesfontein. But we are in no hurry so we enjoy the drive.. Just outside Warmbad we stop for a bite to eat. E cooked us the nicest blue eggs!! Crossing the border at Velloorsdrif/Onseepkans was painless and we hit the road towards Pofadder. 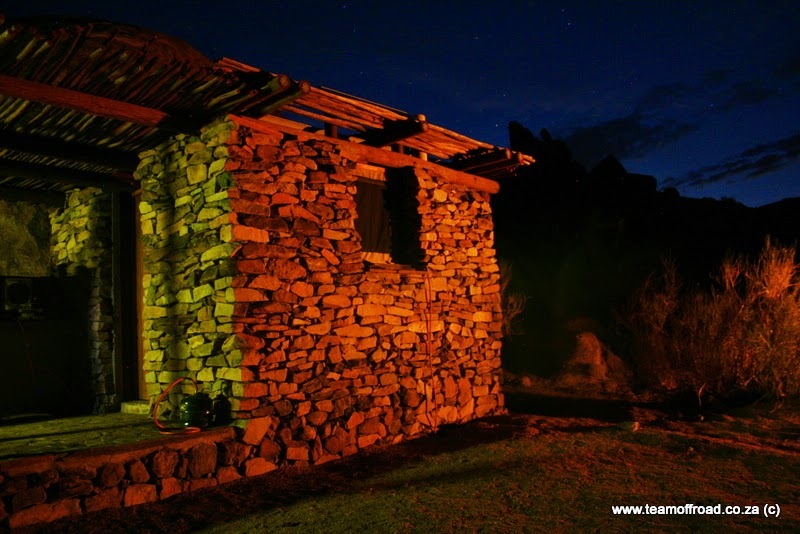 In Pofadder we decide that we were not going to make Loeriesfontein before dark (approx 3 hours drive) and book in at Kleinplasie. It's quite hot so we get some ice and braai wood and enjoy our last lazy afternoon on the stoep of our little room at Kleinplasie with something cold to drink in our hands. We hit the sack early because tomorrow we want to get up at 05h00 Republic time to take the long road to Cape Town. It is very early when we take to the road. First we fill up with diesel and then we negotiate our way through Pofadder's early morning traffic to get to the Bitterfontein road. No seriously, minibus taxis all over the place!! There is a huge solar energy project under way outside Pofadder and the minibuses are used to transport workers to the site. Pofadder now has peak hour traffic jams at 06h00 on weekdays. It is cool and there is not a breeze in sight... We manage to get out of Pofadder at 06h10. We make good time and before long we hit the tar just outside Loeriesfontein. We turn off towards Nieuwoudville, drive thru the town and head off towards Papkuilsfontein. Nice road, but the cattle grids are extremely narrow, and plentiful. Not much to report on the rest of the road, but we hit tar again at Traveler's Rest, where we duck in to get a cup of coffee and a sandwich. We were both tired and hungry. Our dirt road adventures also come to an end here, as we will be driving on tar from here all the way home. We progress over Pakhuis Pass, through Clanwilliam and past all the Stop/Go's of the roadworks. As we crest the Piekenierskloof Pass we hit a typical Western Cape cold front. We stop at Piketberg for a leg-stretch and an energy drink. From there on we are in heavy traffic, wind and rain all the way to Durbanville. In Durbanville we stop to pick up the Woof at Ouma, and also get dinner and a lekker long chat. Warm coffee is also welcome. After all that we arrive at home at about 21h00, tired but grateful to be home in one piece. 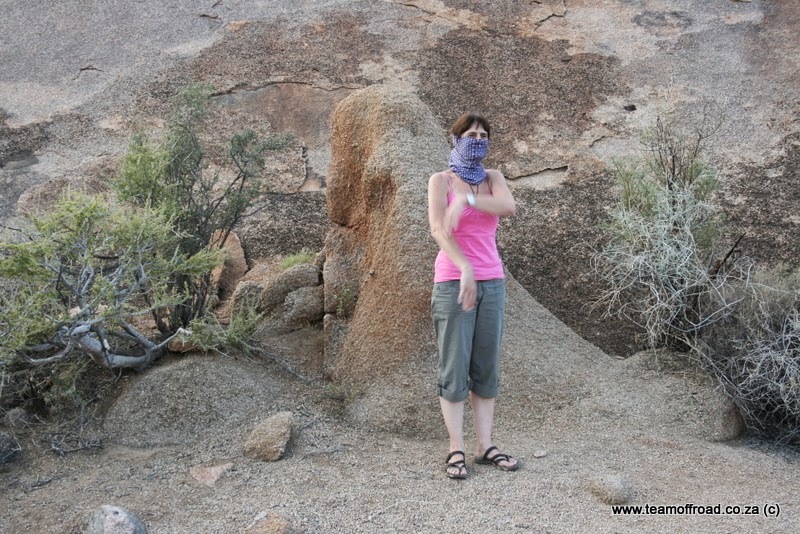 This is not our first time in the Richtersveld, and we enjoyed it even more than the first time. It's not a place to look for wildlife, unless you are after insects. 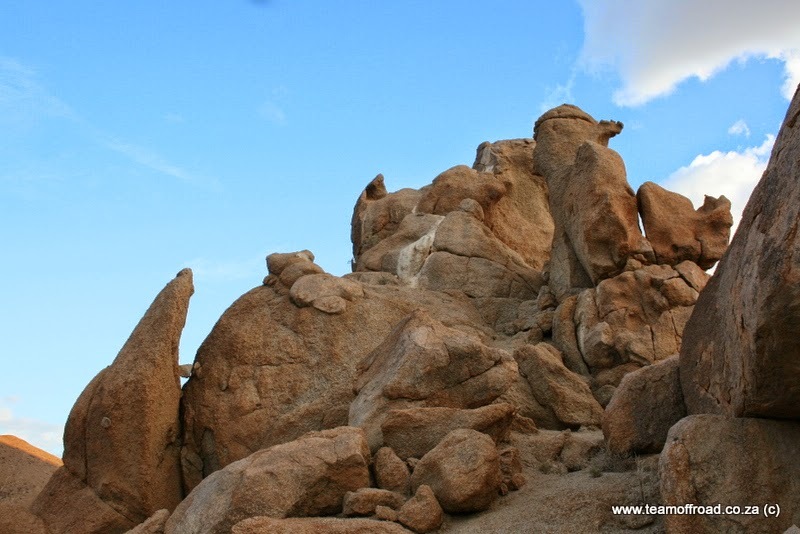 It is a place of magical rock formations and amazing geology. it is a place for peace and quiet, if you dont camp around the popular river camps, and it is a place where one can lose oneself in thought. Truly relaxing. The roads are bad, but please leave it like that! It forces you to drive slowly and to take in the amazing scenery. Luckily the distances between places are short so day drives to other places are entirely possible. 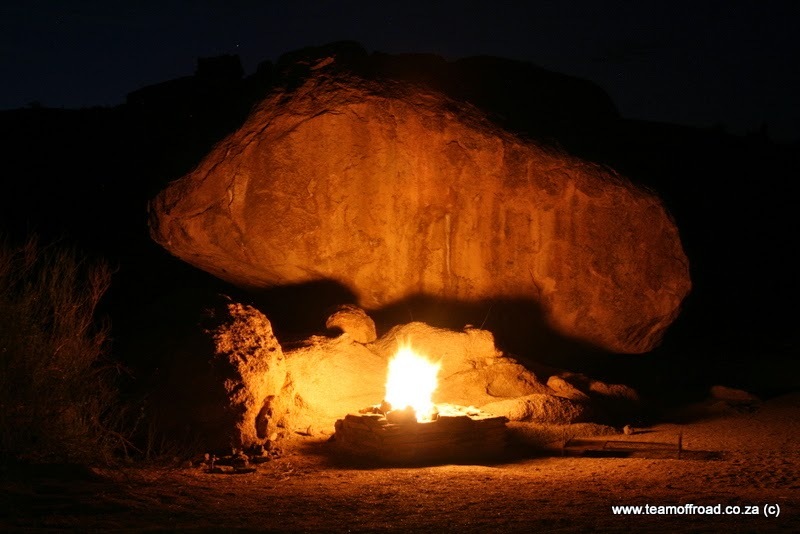 The addition of running water to the Kokerboomkloof campsite is a bonus, but with that the solitude of the place will be ruined, as more and more people will want to camp there. We were fortunate to have the entire place to ourselves for one night, and it was fantastic. The silence is deafening, and will hurt your eardrums. It is the complete opposite of Sendelingsdrif where the mining activities seem to run 24/7. 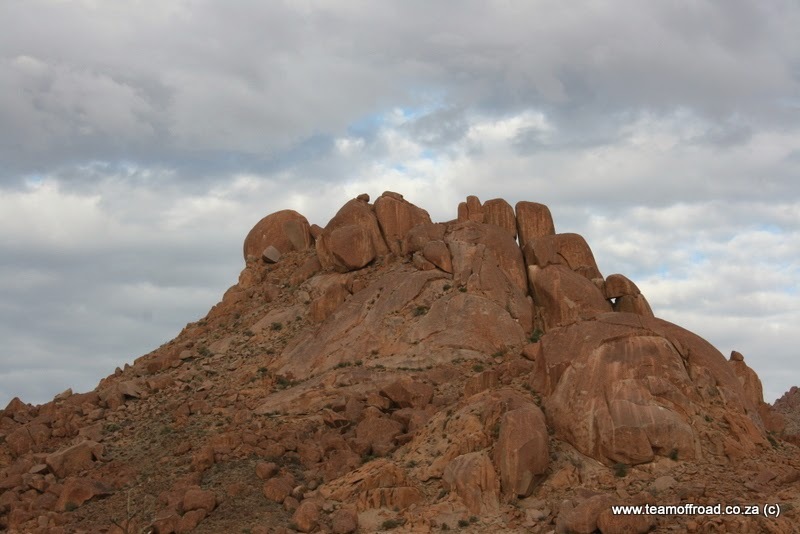 When visiting the Richtersveld, please choose your time wisely, and also enquire about rainfall shortly before you go. Stagnant water after unexpected rains, especially during the warmer months, is what causes the population explosion of muggies. It is not completely unbearable if you are prepared for them. Luckily we were. The service from the SANParks staff was friendly, polite and courteous as always. The girlie in the shop at Sendelingsdrif was a bit p'ed off when E asked her about the age of the bread on the shelf, and we had a good giggle about that. They sell the basics, but dont expect too much. The bread was actually quite nice... toasted.. and their ice is cold. The immigrations staff was also friendly and efficient. This is something that doesnt happen often on the SA side of the border. So we were pleasantly surprised. Fish River Canyon. This is my first time and I was awestruck. Most impressive is all I can say, and I know for a fact the pictures I took does not do the place any justice. If you haven't been there before, do yourself a favour. Our camp at Canon Roadhouse was comfortable, but noisy. All the showers and toilets were clean and in working order. At Hobas we experienced a "deurgangskamp" type atmosphere. Every morning by 09h00 the campsite was empty and from 17h00 onwards there was a bussle as campers came in and pitched camp. It was busy, but never really noisy. This is the best place to camp if you want to visit the canyon. The roads in Namibia are good..... enough said. Since our last trip we bought a new Howling Moon Safari Dome tent with gazebo extension. We tested it once on a weekend trip and was quite impressed with it. This camping trip tested it to the max and it is a comfortable tent which is easy enough to pitch and break down. The gazebo extension also works well for longer periods, and the link between tent and gazebo is waterproof, wind proof and mozzie proof. I was gifted this K2 Kariba shower but without any fittings. Pieter sold me a battery powered camping shower which I modified to work with the Kariba. This came in quite handy at Kokerboomkloof where we had no hot water, and I am impressed with the hot water we managed to get out of this little gadget. Even E had long showers....The kariba also doubles up as a gas stove, so we left the coocker plate at home. This was a mistake, as the Kariba is heavy on juice and a lot of heat goes to waste when we cook the kettle on it for coffee in the mornings. Next time the little round cooker plate goes along. I has a 45l Fortuner tank fitted to the "Tripod" before we left, and that also worked nicely. We filled up a total of 3 times and got about 1000km between fill-ups. No leaks, no fuss and it fills easily too. This is definitely a bonus as it released some space on the roofrack where the 2 x 20l Jerries used to go, and we didnt have to decant diesel which is a crappy job at the best of times. As an experiment I built a top deck at the same height as the bottom of the canopy. This deck enclosed the truck slide in the loadbed. This worked very well, and will have to be built properly now. It is quite rough and not finished off properly as the idea was to remove it should it not work. Since I had the Engle 40l fridge serviced and the filters cleaned and regassed it works beatifully. Plus the little insulation blanket I installed between the cover and the fridge turned it into a very good coolbox when the power is off. This is recommended!! Our auxiliary battery gave problems. It is a Probe 95AH High Cycle battery I bought 6 months ago. It just didnt want to hold charge, and we had to switch the fridge to -1 at night to preserve the battery as much as possible. Luckily it cooled down enough at night to prevent stuff from defrosting. I know I know, it is under warrantee and I will get a new one if I take it in. BUT, that warrantee didnt keep the beers cold when it mattered. The D4D behaved well once again. Even with a load on the Richtersveld tracks it returned an average of 8.7km/l. We used 4H from the moment we left the tar, and only back in 2H once we reached Pakhuis Pass outside Clanwilliam. For stretches in the Richtersveld we even engaged 4L. Once on tar we didn't spare the horses and maintained an avarage speed of 115km/h. On gravel we obviously slowed down, but on those nice long straight Namibian dirt roads we maintained 100km/h at times. I am satisfied. Hiluxers we met along the way. On our last day at Kokerboomkloof a group of 4 vehicles pulled into the campsite. One of them a Land Cruiser which stopped at our tent. Manie (Maniac) got out and we had a chat. They were camping at De Hoop. While we were getting ready to leave Travelers Rest outside Clanwilliam a monster Hilux SFA pulled in and E said, "Kyk hier kom Kaspaas"... It was Cobus (Vliegbakkie) of Red Pepper Bumpers fame, from Velddrif. 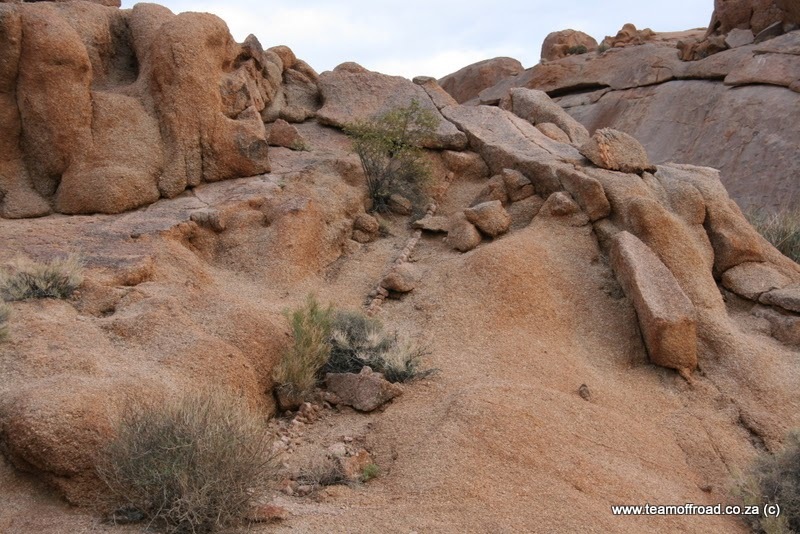 They were on their way into the Cederberg for a bit of a break. After a long chat we were on our way again and they went in for coffee..